New Delhi: The way appears to have been cleared for Anna Hazare to end his fast possibly on Friday when Parliament will discuss the Jan Lokpal Bill along with other civil society drafts on the subject after Prime Minister Dr Manmohan Singh made the ice-breaking offer. Hazare set three conditions to break his ten-day fast declaring publicly that all civil servants should be brought under Lokpal, a Citizen Charter should be displayed at all government offices and all states should have Lokayuktas. The 74-year-old Hazare said that if Parliament considered the Jan Lokpal bill and there was an agreement within the House on these three conditions, he would break his fast. The Prime Minister took the first step towards breaking the ice when he made an open offer in Lok Sabha that Parliament will consider the Jan Lokpal Bill along with bills proposed by others, including Aruna Roy and Dr Jayaprakash Narayan, and the record of the discussion would be sent to the Standing Committee. Leader of Opposition Sushma Swaraj supported Dr Singh’s appeal after which an unanimous appeal was made from the Chair by Speaker Meira Kumar. After late night discussions with senior ministerial colleagues on modalities of Friday’s debate in Lok Sabha, Finance Minister Pranab Mukherjee said talks are on with Team Anna but declined to go into details. “Parliament, after the Prime Minister’s speech and appeal, unanimously requested Anna Hazare to break his fast. 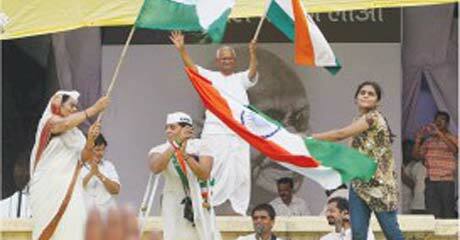 I do hope Anna Hazare will respond. We wish that he should devote his energy in the service of the nation for many many years,” he said. Earlier, Law Minister Salman Khurshid, who attended the discussions with Mukherjee, said there will be discussions in Parliament on Jan Lokpal Bill. Asked whether it will be in the form of resolution, Calling Attention Motion or under a rule that entails voting, he said it has not been decided yet. He said other civil society bills would also be considered apart from the Jan Lokpal Bill.